In the mid 1950s, airplanes evolved into large jetliners and airports had to find more powerful vehicles to tow them around. In the Soviet Union, one solution was to build a large two-driver sedan-bodied tow car with the engine out of a tank, and it was probably the biggest sedan in the world. Reliable sourcing for this behemoth of a sedan called the MAZ-541 is few and far between, but there’s some consistent information out there that gives us a good idea of what this thing was. It was engineered as a replacement for the large MAZ-535 tractors which were initially designed for towing military equipment and weapons like missiles, and not necessarily the perfect design for maneuvering a large aircraft around the airport tarmac. Before that airports just used conventional trucks. The MAZ-541 was built by the Minsk Automobile Plant (where the MAZ designation initials comes from), and only three were produced with the first coming off the line in 1956. Some articles indicate there may have been 13, others claim 10 more were planned but never produced. The familiar three-box sedan body style of the 541 was likely more a matter of form following function, as it meant the vehicle could attach a tow line much closer to the aircraft than the large tractors it replaced, which helped maneuverability. The sedan body style was also so the second driver could operate the car in reverse. This way, they didn’t have to worry about turning it around. That’s right, there were two drivers, or at least two driving positions. But, as mentioned in this article on the MAZ-541 featured on Russian Power, the amount of styling that went into the sedan is surprising considering its utilitarian roots and industrial manufacturer. There’s clearly some effort put into the flared body, chrome features and stylish grille. 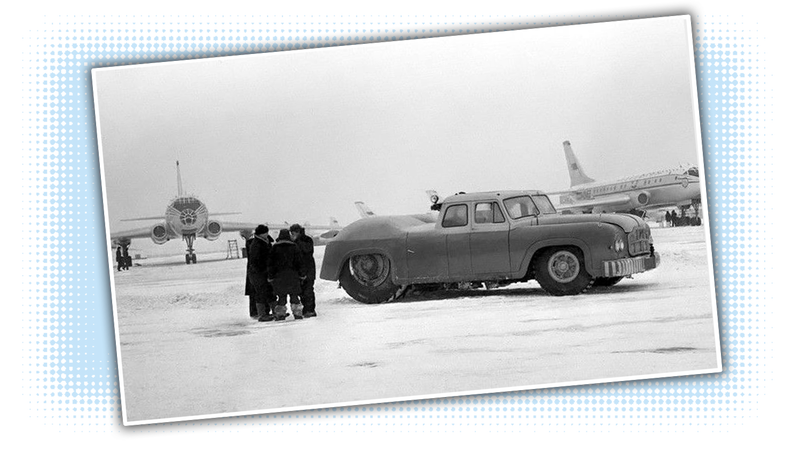 Then again, the same article claims the car was used in service at Sheremetyevo International Airport near Moscow where it could make a big impression for the Soviet Union to international travelers, so maybe they wanted to ensure it had a look that wasn’t purely just purposeful. The MAZ-541 featured the liquid-cooled diesel V12 engine out of the T-34 Soviet medium tank with 38.88 liters of displacement and reportedly 500 horsepower, and possibly got around 0.5 MPG, according to English Russia. It also reportedly had a five-speed transmission with three forward operating gears, and two for reverse. It was all-wheel drive but could disengage the front axle, and featured two different sizes of wheel. In the front, it reportedly sourced its rubber from the 6X6 YAZ-214 dump truck and had larger wheels in the back from the MAZ-525 dump truck, according to the description from this “News in the world of cars” YouTube video. The body was 7.8 meters long (or roughly 25.6 feet), 3.4 meters wide (or roughly 11.2 feet) and 2.8 meters tall (or roughly 9.2 feet). It weighed over 30 tons, and was reportedly specified to tow up to an 85-ton load, but may have towed up to 100 tons, according to Autoforum.cz. The car was evidently prominently displayed in promotional footage of the supersonic TU-144, often referred to as the “Soviet Concorde,” but as airliners continued to grow in size and weight, the three cars fell out of use by the 1970s, and none of them seem to have managed to survive. It was a Soviet design through and through—big, ugly and powerful, and one of the largest and strangest vehicles ever produced. We may not be able to drive one anymore, but it seems like there are quite a few examples of scale models floating around. That’ll have to do.